[..] Museums are the space we have evolved to collect material things, images of nationhood are housed catalogued and displayed there, as are small personal obsessions. Treasures of all kinds, looted, bought, found or stolen are woven into narratives of possession and belonging. We are increasingly familiar with the idea of the museum as the ultimate destination of all past objects, or at least surviving examples of those things. And recently it would seem, that the museum has come to dominate the horizon of every material thing. To achieve museum status -as an object or individual- is to participate in the past of the future. We tend to imagine Public Museums and Department Stores at opposite ends of the cultural spectrum, although they have more in common than we generally assume. Both actively accumulate, display and distribute the artifacts they contain. Both present us with collections of things; constructing specific social relationships between artifact and visitor, between goods and shoppers. Both aim to structure the limit of what's possible through our encounter with material artifacts. We in turn replicate this learned behaviour in our interaction with a wider material culture. Perhaps our social relations have less to do with specific things; for example, shoes, toys, gifts, ceramics or works of art, and more to do with seductive modes of their collection and presentation. What the two places most obviously share -in their encyclopedic ambitions, complex layout and subsequent use by visitors- is the inducement of a highly creative state, known as browsing. Browse mimics this state by arranging a display case of photographs. Browse feels like a visitor guide, although instead of leading you on a prepared tour, its layout invites you to reflect upon your relationship to objects stripped of their immediate context. Liberated, you will be encouraged to leisurely slide in and out of various types of classification. Browse ! 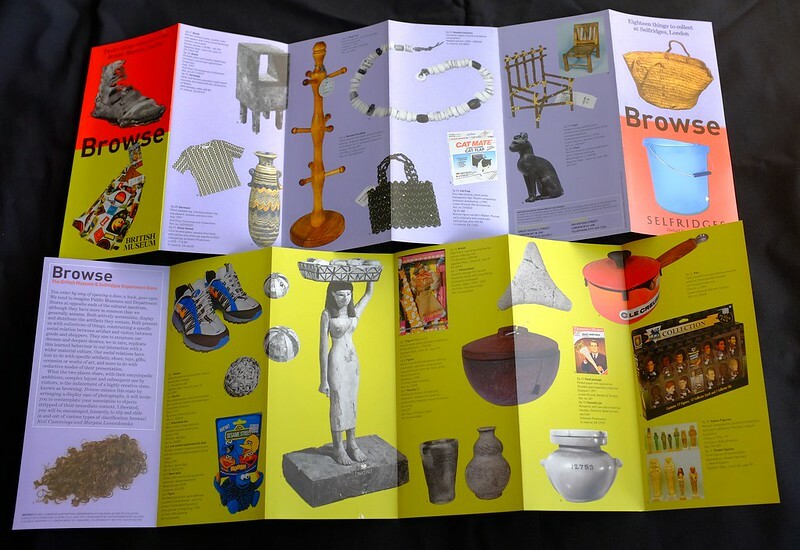 Browse was readily available from dispensers in both the British Museum and Selfridge's Department store for the duration of the exhibition.